Close to the Edge sits high on my list of all-time favourite albums. I thrill to its virtuosity, admire its ambition, expand with its mysticism, forgive its silliness, embrace its humanity and delight in its complexity. I wonder at its timelessness and the continuing relevance of its lyrical message. If this article leads someone to discovering or reacquainting themselves with the unique world of Close to the Edge I will be a happy writer. Close to the Edge was released on 13th September 1972 as Atlantic Records SD7244. It was the band’s fifth album and was a critical and popular success, reaching the Top 5 of album charts in both the UK and USA. There are three pieces on the album: the side-long title suite and two long multi-part songs on Side 2. The cover was designed by Roger Dean and has the first appearance of the Yes logo. 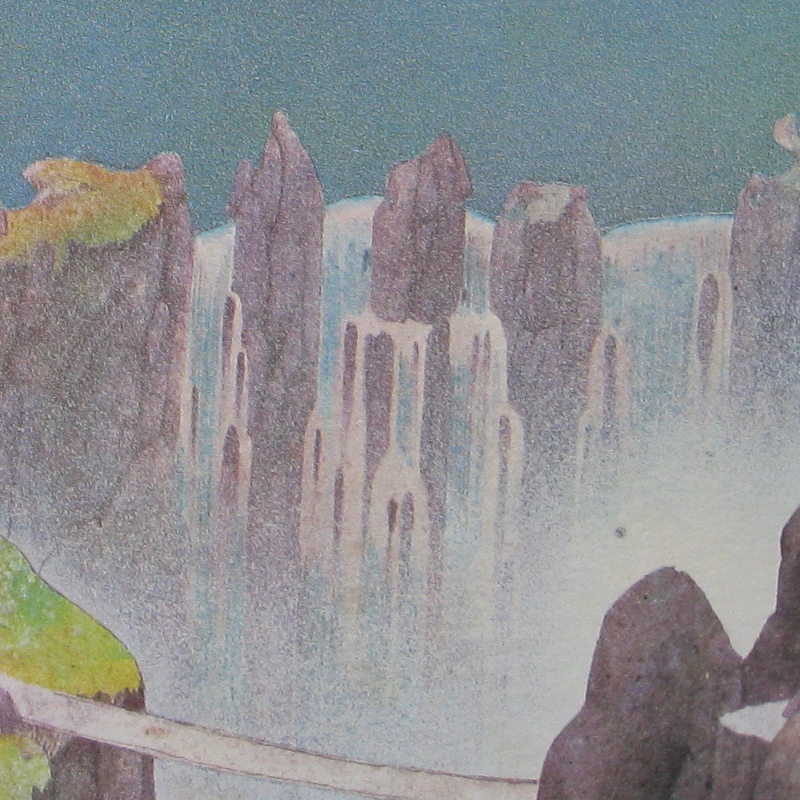 The inside of the gatefold is a Roger Dean fantasy landscape. Many critics, fans and commentators consider the album the finest in the Yes catalogue. 1. For those who place value on the lyrics – and there are many words on this album – how to introduce the indirect symbol-heavy imagery of Jon Anderson without sounding confusingly vague or cringingly new-age? 2. Can an often obtuse meditation on life’s spiritual and earthly journey be made relevant forty years on? 3. Will any of the following questions engage the reader/listener… What constitutes a border in the 21st Century ? Where is air cleaned ? Why are species dying out ? Who owns the farms? 4. How could a listener new to this album (or progressive rock generally) find an entry portal? 5. Where does one acquire an open mind these days? First there is a mountain then a mountaineer. You stretch sinew, pant and gasp to glimpse new vistas, embrace the thrill of being out of your depth. But you are no mere adrenalin junkie; there is also the topography of the soul. The feminine does not alarm you. With purposeful step you look forwards and upwards to the high country; there is a rhythm and perhaps a martial beat, but it is your own. At the summit you pause, enthralled as much by your own potency as the sky that bleeds into heaven. For you, astral traveller, dreams carry wisdom and reality is a waking dream. Connection is all. The cord of life that resides in your organic centre pulses with the life of the planet. “I and thou”. Voices join in an ecstatic chorus that honours both Gaia and sensual entwining. You are willing to move through the angles of the eternal triangle: pilgrim, preacher, teacher. You reach out to others and answer earth’s call. Having avoided the simplistic and often just plain inaccurate banalities of much rock ‘criticism’ of progressive music, you are willing to sit down and have a go at something different. Recognising your own preconceptions – we all view the world through coloured lenses – but unwilling to be limited by them, you have given yourself permission to enjoy music for music’s sake. Incongruities are permissible; the world isn’t linear. Perhaps you have some background in Western composed music and are undaunted by an extended suite that is suggestive of sonata structure. Maybe you just like the idea of a journey of more than three steps and have noticed a quiet calling to adventure like Spring’s germinating quiver at the end of inert Winter. You sense that openness is cousin to innocence. You are the Mole leaving home without his overcoat, Bilbo stepping out his front door, Pooh venturing into the Hundred Acre Wood. You know that this is an expotition not a migration. Ramones and Machine Head will always be there for you. I loved the cover on this album but don’t remember ever hearing it, oddly enough. I do have Fragile on CD which I think is a superb album. Well, my friend, if you rate Fragile highly, you will certainly enjoy Close to the Edge. Thanks for stopping by Vinyl Connection. Yes were never high up on my all time fav bands list. At the time I ‘discovered’ them I had just became interested in Jazz Rock a la, Return to Forever,Al dI Meola Mahavishnu Orchestra and Billy Cobham etc. and these bands seemed at least five steps beyond Yes. Though as musicians I always dug Steve Howe and Chris Squire. But I shall now make a point later this evening of scouring Google for the album and have a listen. Ah, Jazz-Rock. Another derided genre I enjoy greatly. Perhaps I’ll put an article together on that topic some time. Cheers. One of all time favorite Album covers is Argus, Wishbone Ash. It would make a wonderful post. The Vinyl cover is better than the cd and one can just make out the …..well you know what it is if you’ve seen it, and the Roman(?) soldier is looking toward it. If you have the vinyl cover look closely a the warrior and follow the his line of sight.There appears to be a ufo toward the left hand side. Great post, and yet another album I’m not familiar with, although I AM familiar with Yes. Fragile was the first album I ever bought (at age 11, with allowance money). I’d heard “Roundabout” on the radio and was hooked. After a few listens, though, my favorite song was “We Have Heaven”. It’s interesting that the first sentence of Macan’s quote indirectly references another cut from Fragile, “Heart of the Sunrise”; that’s probably intentional, don’t you think? Dean did the cover art for Fragile too, but I definitely prefer the now iconic, ‘plumper’ logo that he introduced for the first time, as you note, on Close To The Edge. Thanks for your thoughts and recollections, JDB. An album purchased with hard-earned pocket money is an album cherished, eh? And as I noted above, I find it hard to imagine that anyone who enjoyed Fragile would not get into Close to the Edge. Regarding the “Heart of the Sunrise” allusion, it is intentional but it’s not Macan. Responsibility resides with your correspondent, I’m afraid. I thought it might be amusing to sprinkle a few Yes song references through the piece – a bit of fun for fans. So well done, you. Apols for the clumsy referencing – I’m a bit out of practice with academic conventions! An attempt has been made to clarify. I wonder about a piece on ‘My favourite Deans‘? 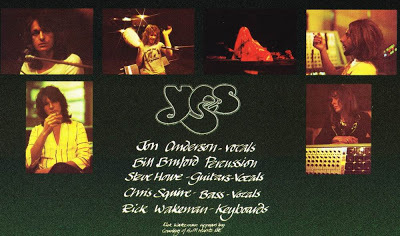 Great post, I’ve never heard a Yes album that I haven’t liked, except for some of the Rick Wakeman solo stuff. Thanks Mr 45spin. Am with you on the Yes catalogue generally. I enjoy the sometimes pooh-poohed Trevor Rabin albums – their more steroid-driven muscular rock flavourings hit the spot in a certain mood. Mr Wakeman I didn’t follow assiduously past the 70s – too varied in quality. Though a couple of the solo piano ‘New Age’ CDs are pleasant background music. And you and I (haha) share this album on our respective “best ever” lists. Glad it brought back pleasant memories, Marie. “You have given yourself permission to enjoy music for music’s sake.” Unimaginable riches for those with an open mind, and the means with which to explore. Great post!! Thanks Mr PG. C to the E is great material to work with! Glad you’re enjoying the trip CB. I really am enjoying it. I’ve been sprinkling some soundtrack listening into the mix. Amazing how many good ones I’ve collected over the years. I’m a film lover and some of the music is just fantastic. I’ll pop over in the next while and see what you’ve come up with on the ‘Soundtrack theme’. Curious. In the meantime keep giving love to the music. YES Yes Yes…..
Really great post, Bruce. A band that I want to hear and own more of. I still haven’t seen a copy of this in the wild, but that’s what online hang-outs like Discogs are for, eh? Thanks James. As Close To The Edge was one of the popular albums, I think you can be optimistic about tracking down a decent copy.